This is the house I used to live in 60 years ago. My bedroom was top right. There is sad news from Slaugham which has lost one of its most-loved residents with the death of Sir Alan Urwick who passed away last week. Here follows two announcements from the media. Sir Alan Bedford Urwick KCVO CMG Knight St John passed away peacefully at home on 8th December 2016, aged 86. Beloved husband of Marta; father of Christopher, Richard and Michael; father-in-law of Valentina, Carolina and Viviana; and grandfather of Victoria, Oliver and Sofia. A funeral service will take place at 2pm on Tuesday13th December 2016 at St Mary's Parish Church, The Green, Slaugham, West Sussex RH17 6AG. Sir Alan Bedford Urwick KCVO CMG (2 May 1930 – 8 December 2016) was a British diplomat. Alan Urwick was educated at Dragon School in Oxford, Rugby School, and New College, Oxford. Urwick joined the British diplomatic service in 1952 and undertook tours of duty in Western Europe, the Middle East, Moscow, and Washington, D.C. He served as the United Kingdom's ambassador to Jordan (1979–1984), Egypt (1985–1987), as well as High Commissioner to Canada (1987–1989). He left the diplomatic service in 1989. He then served as Serjeant-at-Arms of the House of Commons until his retirement in 1995. He died on 8 December 2016 at the age of 86. On 13th March 2017 the Daily Telegraph published an obituary to Sir Alan Urwick together with a picture on him wearing the uniform of the Serjeant at Arms. It gives a truly inspiring story of his life and is well worth reading. 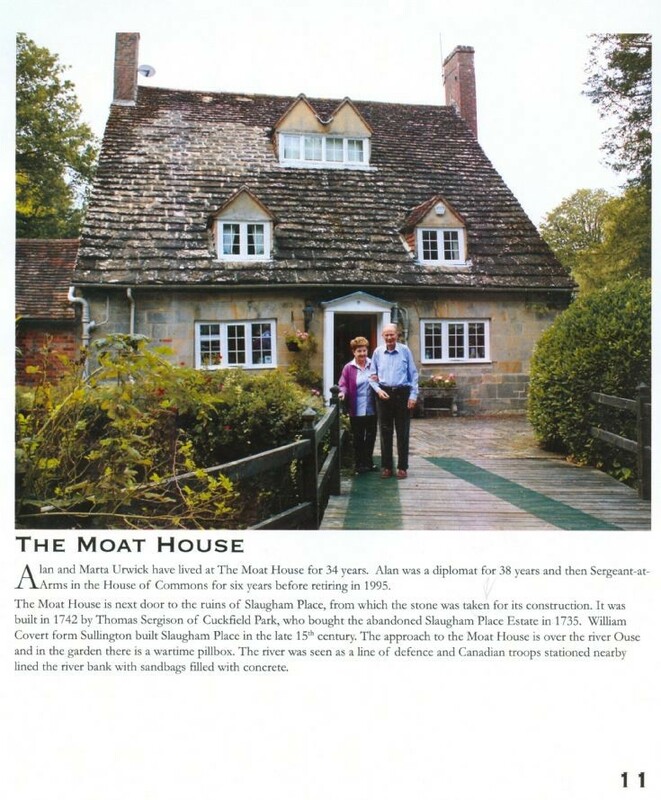 It mentions how Sir Alan restored the Slaugham Place ruins with the help of English Heritage. They omitted to mention the work and skills supplied to the project by Arthur Shopland, and so I will mention it here! Select Open Document to read the obituary. A Service of Thanksgiving for the life and work of Sir Alan Bedford Urwick KCVO, CMG, KStJ took place in St Margaret's Church, Westminster Abbey on Thursday, 19th October 2017 at Noon. Select Large Version to read an article published in the following day's Daily Telegraph. Sir Alan Bedford Urwick was born on May 2, 1930, and educated at Dragon School in Oxford, Rugby School, and New College, Oxford. He joined the British diplomatic service in 1952 and undertook tours of duty in Western Europe, the Middle East, Moscow, and Washington, D.C. Alan also served as the United Kingdom’s ambassador to Jordan (1979–1984), Egypt (1985–1987), as well as High Commissioner to Canada (1987–1989). Sir Alan left the diplomatic service in 1989 and then served as Serjeant-at-Arms of the House of Commons until his retirement in 1995. Arthur Shopland was a mighty fine man. Solid, honest most reliable. He highly respected by the Urwick family. His demise was indeed a mighty loss to the Urwick family and the broader range of people who knew him. Mighty fine man was Arthur.